Hello! Today for Lawn Fawn Inspiration Week we are featuring the new Wavy Sayings and Simple Wavy Banners and Fancy Wavy Banners. These are some great staples to have in your stash and I have been using them constantly in my cards lately. This card has the folded Fancy Wavy Banner at the bottom with one of the best Wavy Sayings in the set! I colored my rainbow stitched umbrella with Tombow markers on Bristol paper and blended it with water. 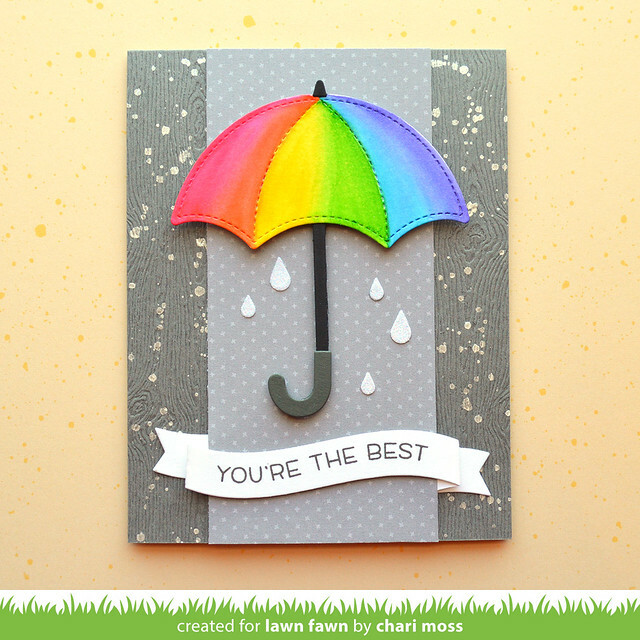 I kept the rest of the card grey and white neutral so that the umbrella really popped. 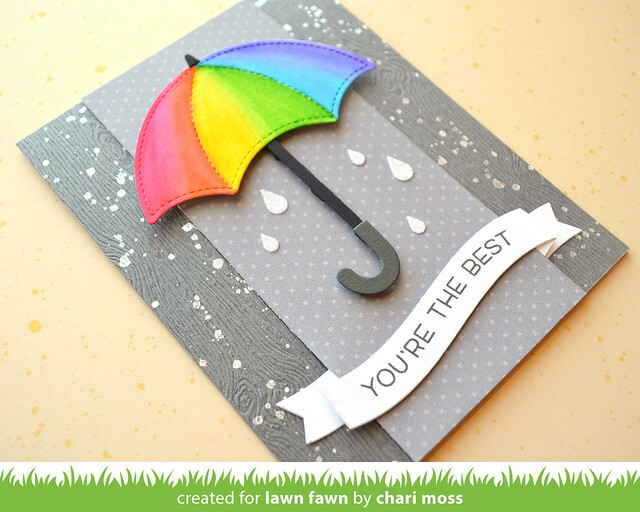 I used the grey woodgrain cardstock for the card base and flicked white metallic watercolor to coordinate with my white sparkle raindrops and look like rain in the background and added the grey pattern paper from Spring Fling to the center as a focal panel. I think this would be a fun card to send to someone who is feeling down to brighten their spirits. Be sure to check out the Lawn Fawn Blog for more projects with Wavy Sayings and Simple Wavy Banners and Fancy Wavy Banners. Also, this card is part of today's intro video. Soooo pretty!! I love your umbrella! !